This sound irregular yet I ponder what advancements will look like 5years from now. Have you ever envision that the reality of the situation will become obvious eventually when you'll have the capacity to accuse your telephone of a smoldering fire and not power? I know Business situated individual will consider how conceivable could that be? All things considered, FlameStower Charger answers your inquiry. 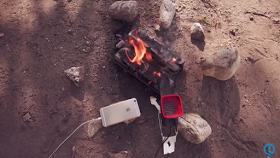 This convenient, moderate charger productively catches abundance heat from cooking or open air fires to charge your USB-controlled gadgets: phones, GPS, and the sky is the limit from there. It's configuration takes into account simple setup, charging, and putting away, making FlameStower your number one. 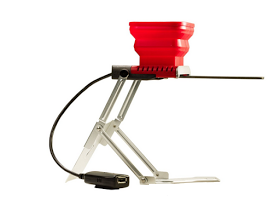 It's intended to work with any open fire: cooking stoves, pit fires, crisis candles, anything! Once the cutting edge is in a flame, the warm vitality is exchanged to the Thermoelectric Generator (TEG). The inverse surface of the TEG is in contact with the water repository. Hot side gets hot, chilly side stays moderately cool, and the temperature distinction creates power. 2.5 Average watts of power-enough to charge your phone in about 2.5 Hours; 1 minute of charge time gives 2 minutes of talk time. Ain't satisfied on how it works? Kindly watch the video below. Is it a welcomed innovation?